Discussion Topic: What’s your favorite RPG on the Super NES? Here we see an ad for the Super NES version of Ultima VII: The Black Gate. Apparently, when VII received its port to Nintendo’s console, its Roman numeral designation got the axe. As a result, the title became merely Ultima: The Black Gate. I’m not a big fan of the SNES ports of the Ultima games (VI and VII). In the process of chopping things down to fit in a reasonably-sized ROM cartridge, a lot of content and features were lost (including the Roman numeral in this case). But at the same time, those ports likely gave console fans a taste of the Ultima universe that they would not have had otherwise. 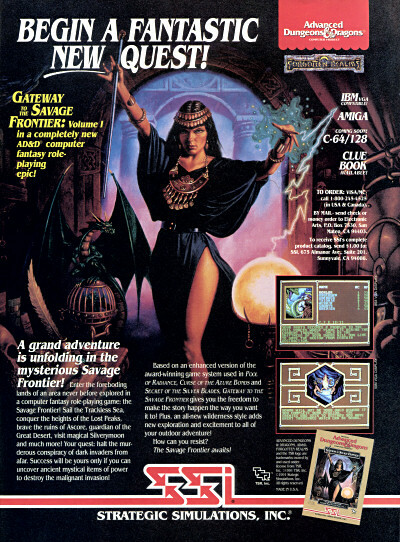 As for me, I was lucky enough to originally play the Ultima games on the PC (and the Atari ST, in the case of Ultima III), so I guess I am spoiled. Discussion Topic of the Week: In your opinion, what’s the best console port of any Ultima game?